A lobster roll at Champlin's. In my experience, there are no two lobster rolls created equally. Sometimes they have mayo, sometimes they have butter, and other times, neither. I’m willing to try them all, but I only like a few. In Rhode Island, my favorite remains Flo’s Clam Shack, which makes the plainest lobster roll I’ve ever had — unadorned lobster meat on a hot dog bun with lettuce. You can add the mayo yourself (I don’t). Knowing that dessert at Frosty Freez is not far away, makes it even better. 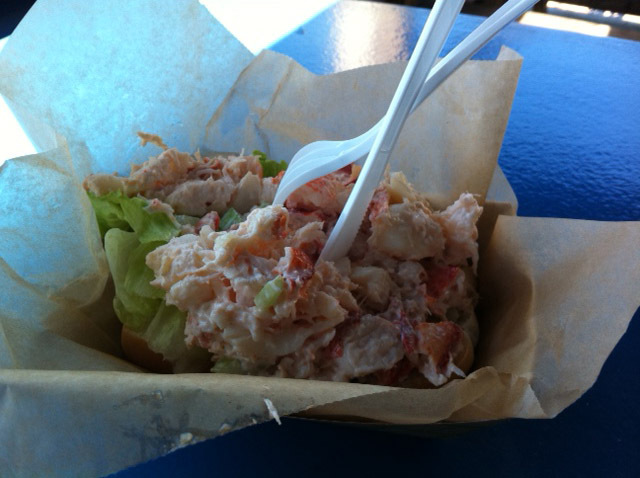 Recently, I tried the lobster roll at Champlin’s Seafood, where they mix the lobster meat with mayo and celery. Of course, you can’t beat the location — as my out-of-town friends gazed at the boats in the water at Galilee, they said, “This is exactly what you think of when you think of New England.” I also had them order one of my local favorites — clam cakes (think hushpuppies with clams mixed in) — which were a huge hit as well. As a local, perhaps my favorite part of Champlin’s is the seafood store downstairs, where you can buy fresh scallops, tuna, swordfish, shrimp, etc. to cook at home. And if you pick up some fresh-picked corn at a farm on your way home, you’ll really have the perfect summer meal. That’s the way we love lobster rolls – a little mayo and celery. So New England. Oh, Champlin’s! Need to get there before summer ends. Thanks for the reminder! Oh oh oh, that meal was heaven – though afterwards, I thought I’d never want to eat again. Rhode Island has eight new fans in Europe! We had such a great vacation! So glad you ended up in RI this summer for vacation — I miss you guys! I did find a shrimp tail in my lobster roll at Champlin’s. Still a great meal, even though nobody joined me for a bloody mary. It was so much fun to hang out with you guys. Great seafood and my favorite “to go to” seafood market when in RI visiting my parents! The market smells so great that you could sell the aroma also. Sweet memories for me! And yes, the view is priceless! I am very homesick right about now!